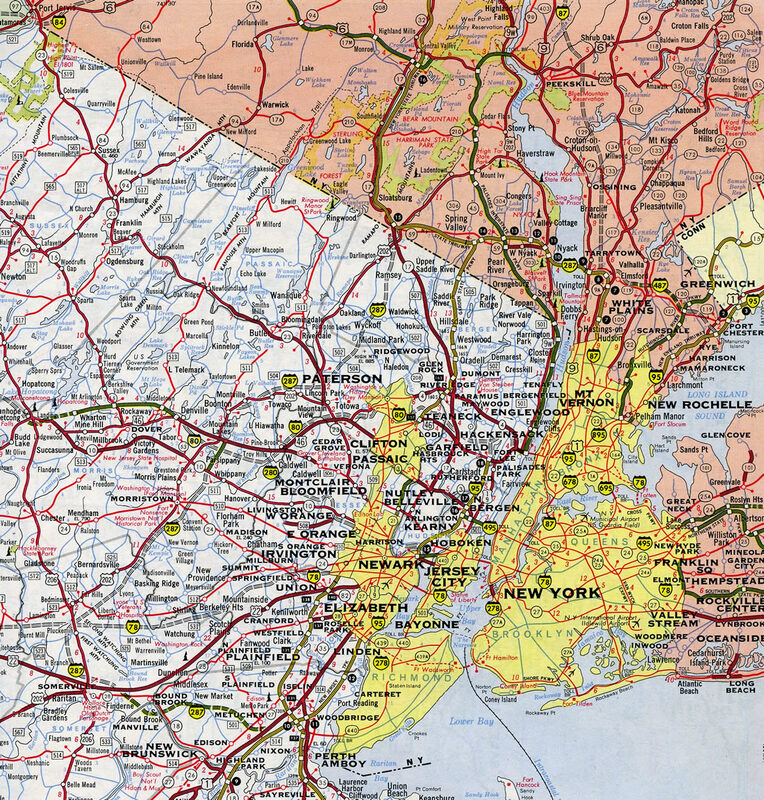 Interstate 287 encircles the New York City metropolitan area along three distinct roads. 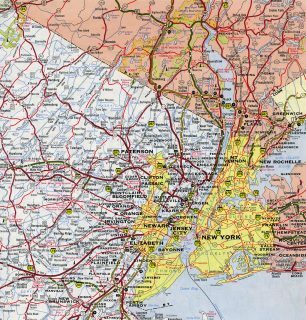 The North Jersey portion provides both a commuter route and bypass from the New Jersey Turnpike (I-95) at Edison west to Somerville and north to Morristown, Oakland and Mahwah. This section of I-287 ties into the New York Thruway mainline (I-87) just across the New York state line at Suffern. Interstate 87 and the Thruway turn south at East Irvington toward Yonkers and The Bronx, New York. Interstate 287 continues east along the often congested Cross Westchester Expressway to Rye and I-95 (New England Thruway) near the Connecticut state line. Interstate 287 in New Jersey is part of High Priority Corridor 63: Liberty Corridor. The Cross Westchester Expressway as I-487 – 1960 Rand McNally North American Road Atlas. Interstate 87 was proposed separate from the New York Thruway, from the Cross Westchester Expressway north to Brewster, until 1969. An earlier alignment showed the route staying closer to the Hudson River north from Tarrytown. 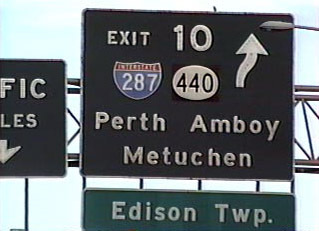 Replaced button copy signage at Exit 10 from the Outer Roadway of the NJ Turnpike north in October 1998. This guide sign, and others for I-287 and NJ 440, were replaced by Spring 2000. The cancellation of the Somerset Freeway in North Jersey in 1982, the proposed alignment for Interstate 95 between Lawrenceville and Metuchen, led to an extension of I-287 east from South Plainfield to the New Jersey Turnpike in Edison Township. This segment was previously designated as Interstate 95. AASHTO approved the renumbering on June 26, 1985. Interstate 287 (Cross Westchester Expressway) weaves southeast between Rye Brook and Harrison toward I-95 in the city of Rye. Photo taken 08/29/05. Curving south below the Ridge Street overpass, I-287 advances a half mile to Exit 11 with U.S. 1 (Boston Post Road) at Port Chester. The mainline defaults onto Interstate 95 north in 1.4 miles ahead of Byram, Connecticut. Photo taken 08/09/04. An end shield for I-287 precedes the off-ramp (Exit 11) for U.S. 1. U.S. 1 parallels Interstate 95 from New York northward into Greenwich, Connecticut. Guide signage for I-95 north references the Connecticut Turnpike, which ceased operation as a toll facility in 1986. Photo taken 08/09/04. A trumpet interchange connects the east end of I-287 with Interstate 95 (New England Thruway) south to New Rochelle and The Bronx, New York at Exit 12. Two lanes otherwise proceed east to a wye interchange to I-95 (Governor Lodge Turnpike) north to Greenwich, Stamford and New Haven. Photo taken 08/09/04. One mile ahead of Exit 21 with Interstate 287 (Cross Westchester Expressway) west on I-95 (Connecticut Turnpike) south. The freeway transitions onto the New England Thruway south at the forthcoming state line. Photo taken 06/13/05. The wye (Exit 21) with Interstate 287 west from I-95 south ties into the adjacent folded diamond interchange with Midland Avenue for Port Chester and Rye. I-287 comprises an often overcrowded commuter route west to White Plains and the Tappan Zee Bridge. Photo taken 06/13/05. Exit 21 leaves Interstate 95 (New England Thruway) south for I-287 west to Suffern and south to Morristown, New Jersey. I-95 progresses southwest 11 miles through the suburbs of Mamaroneck, Larchmont and New Rochelle to enter The Bronx, New York. Photo taken by Douglas Kerr (01/01). Succeeding ramps join Interstate 95 (New England Thruway) north with U.S. 1 south and Interstate 287 west at Rye. Photo taken 08/29/05. Interstate 287 travels west across the northern suburbs of New York City before merging with I-87 and the New York Thruway mainline. West from there, I-87/287 cross the Governor Mario N. Cuomo Bridge over the Hudson River between Tarrytown and South Nyack. Photo taken 08/29/05. Interstate 95 north reaches Exit 20 for U.S. 1 (Boston Post Road) south to Rye. Exit 21 follows for both I-287 west and U.S. 1 north to Port Chester. Photo taken 08/29/05. U.S. 1 (Boston Post Road) spans Interstate 95 as Exit 21 parts ways for Interstate 287 (Cross Westchester Expressway) west. Photo taken 08/29/05. Traffic taking Exit 21 from I-95 north combines with an on-ramp from U.S. 1 north. The two lane ramp advances to split with ramps for I-287 west and U.S. 1 north. Photo taken 08/29/05. Motorists separate into ramps for I-287 and U.S. 1 north at a trumpet interchange preceding the merge with the Cross Westchester Expressway westbound roadway from I-95 south. The city of White Plains lies four miles to the northwest. Photo taken 08/29/05. Button copy signs formerly posted at the loop ramp joining I-287 west with I-95 south beyond the Midland Avenue entrance ramp in Rye. This exchange lies a half mile beyond the separation with Interstate 95. Photo taken by Michael Summa (1976). Milepost zero for I-287 stands along the overpass spanning the New Jersey Turnpike (I-95). The ensuing exit leads to a toll plaza and Interstate 95 north to Newark and south to Philadelphia, Pennsylvania. New Jersey 440 extends the freeway four miles east to the Outerbridge Crossing over Arthur Kill onto Staten Island, New York. Photo taken by Chris Mason (10/13/01). One mile ahead of the trumpet interchange (Exit 10) and access road linking the New Jersey Turnpike south with Interstate 287 west to Metuchen, CR 514 (Woodbridge Avenue) at Edison Township and NJ 440 east to the Outerbridge Crossing. Photo taken 06/13/05. The Inner Roadway of I-95 south reaches Exit 10 for Interstate 287 and NJ 440. NJ 440 forms a multi state route with NY 440 east from Perth Amboy, New Jersey to the West Shore Expressway in Staten Island, New York. Photo taken 08/29/05. Traveling north on Interstate 95 (New Jersey Turnpike) through Edison Township, two miles ahead of Exit 10 with I-287 north to Piscataway and NJ 440 east to the Outerbridge Crossing and Staten Island, New York. Photo taken 06/26/05. Interstate 287 navigates westward from NJ 440 and Metuchen to Somerville, where it accompanies U.S. 202 and 206 north to I-78 and Far Hills. Photo taken 06/26/05. Exit 10 departs from the Inner Roadway of the NJ Turnpike to the access road linking I-95 with parallel CR 514 (Woodbridge Avenue) in Edison Township, I-287 north to Suffern, New York and NJ 440 east to Perth Amoby. Photo taken 06/26/05. The NJ Turnpike Outer Roadway northbound at Exit 10 for I-287 north and NJ 440 east. Photo taken 06/26/05. Reconstruction of the access road beyond the toll plaza at Exit 10 in 2015 included replacement of button copy signs at the ramp for CR 514 west to Raritan Center. Photo taken 06/13/05. A circular ramp extends northeast from the toll plaza at Exit 10 to subsequent ramps for NJ 440 east to the Garden State Parkway and U.S. 9 at Woodbridge Township and CR 514 (Woodbridge Road) east to the Fords community. These signs were replaced by 2015. Photo taken 06/13/05. Traffic merges from CR 514 (Woodbridge Avenue) eastbound onto the ramp system connecting I-95 with I-287 westbound just ahead of the slip ramp to NJ 440 east. Photo taken 06/13/05. New Jersey 440 transitions into Interstate 287 north beyond the directional cloverleaf interchange with CR 514 (Woodbridge Road) and the New Jersey Turnpike access road at Exit 10. Photo taken 08/29/05. Two lanes separate from NJ 440 westbound for the exchange with CR 514 and the New Jersey Turnpike. Three lanes proceed west to the borough of Metuchen along Interstate 287 north. Photo taken 08/29/05. Traffic partitions for CR 514 (Woodbridge Avenue) east to Woodbridge Township and I-95 to Newark and Trenton. Photo taken 08/29/05. County Route 514 crosses over New Jersey 440 one quarter mile ahead of the northbound beginning of Interstate 287. I-287 travels west through Edison and Piscataway to Bridgewater where it turns north to Morristown and Parsippany-Troy Hills. Photo taken by Carter Buchanan (06/30/05). “Mario Cuomo Bridge opens amid controversy.” News 12 Westchester (NY), September 11, 2018. “Governor Cuomo Announces Opening of First Span of the Governor Mario M. Cuomo Bridge.” New York State Governor’s Press Office. August 24, 2017. Cross Westchester Expressway, New York Area Roads, Crossings and Exits (Steve Anderson). Oyster Bay-Rye Bridge, New York Area Roads, Crossings and Exits (Steve Anderson).